Blog names are extremely important: 77% of marketers say that proper branding is critical to growth. Bad names can be confusing, hard to remember, hard to spell, and hard for your audience to share with others. A bad name makes it harder to build a following — no matter how much you might personally love it. But how can you tell the difference between a good name and a bad one? By following some key guidelines based on consumer behavior… and then scientifically testing your assumptions. In this guide, you’ll learn exactly how to choose an awesome name and URL for your blog (or brand) in 4 steps. This short section touches on the most important things to keep in mind while choosing a name for your blog, startup or product. We’ll move through these quickly for now, for you to keep in mind when we move on to the brainstorming step. Then, later, we’ll revisit them in more detail. As Rand Fishkin says, names matter. Don’t get confused with something else. Are easy to read and pronounce. Have the .com URL available. Note that you don’t have to love your blog’s name, as long as you don’t hate it. Another thing: the name you choose also doesn’t have to perfectly fit the topic you’ll be going after either, as long as it doesn’t clearly imply something different. Just keep all of that in the back of your mind for now. We’ll come back to these concepts and more in a bit. Note: this guide is for people who want to start a successful blog. I know not everyone cares whether their blog becomes popular, influential, or a profitable business. If you don’t, or if you just want to create a personal blog and name it after yourself, you can stop reading right here. But if you want to build a blog that can become a business — if you want it to be a brand — then let’s keep going. Prefer to download this guide for later? No problem: just click here. The first step to finding a catchy blog name is to create a list of as many ideas as you can. 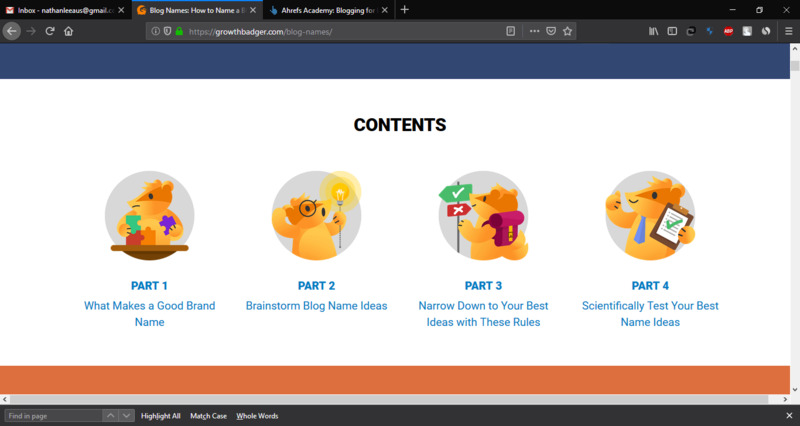 But you don’t have to rely solely on your brain for this — as long as you have a few ideas to start with, I’ll show you 6 great methods you can use to get a lot more clever blog names. Tip: research shows that the early evening is the best time for brainstorming because you’re less likely to filter yourself at that time. How can you come up with ideas? Think about your target audience. How do they describe themselves? Their problems? The topic(s) you’ll be blogging about? You can also go the “unrelated” route and just list some random short words you like. And of course, any words that fit into the topic you’ll be blogging about. Once you have a list of at least 2-3 blog name ideas (or even just individual words), here are my 6 favorite methods for generating a ton more ideas. You don’t have to use all of them, but try at least a few. Method #1: use Google’s “related searches” feature. Just search Google for a word or phrase that describes your topic (or one of the words you’ve brainstormed), then scroll to the bottom of the page and Google will show you a list of related searches. Not only may some of these be good ideas in their own right (HomemadePasta), you can also click on one or more to run a search for that term, which may give you other ideas — for example, a search for pasta dishes may give you a bunch more ideas to name your blog after. Method #2: use thesaurus.com or relatedwords.org. Head over to thesaurus.com and type in one of the words you’ve come up with. Noodles, gnocchi, linguine, macaroni, ravioli, spaghetti, tortellini, fettuccini, lasagna, manicotti, orzo, rigatoni, shells, vermicelli, and ziti. Most of those are pretty long and hard to spell, but some may be good options (NoodleSnob, MacaroniSnob, RavioliSnob and SpaghettiSnob aren’t too bad). For even more ideas, you can also check out the “Word Origin & History” box, or the “related terms” section (which isn’t always an option), or change your search type at the top from synonyms to definitions. Take any of these new words that you like and add them to your list. Then go through the same process with the second part of your name idea, “Snob,” to get even more ideas. You can also use relatedwords.org the same way, especially if thesaurus.com isn’t giving you much to work with. Method #3: use a rhyming dictionary. Phrases that rhyme are not only easy to remember, they’re also judged as more trustworthy than phrases that don’t. It’s a known psychological bias called the “rhyme-as-reason effect“. So why not take some of your word ideas and plug them into a rhyming dictionary? RhymeZone – the standard online rhyming dictionary. Can be organized by syllables or letters. Tip: after making a search try hitting the “Advanced” link for a ranked list. Rhymer – much more advanced rhyming dictionary. You can search by multiple rhyme types like end rhymes, double rhymes, first-syllable rhymes, etc. Don’t get sucked too far down the rabbit hole. None of these are perfect, though. For example, none found “rasta” as a rhyme with “pasta”. Method #4: use word lists. Sometimes you just need a list of words to browse. There are several ways to use this method. Morewords.com’s “words by word length” page lists words by length and first letter. Alliteration is another good way to make a name more catchy, so grab a list of words that uses the same first letter as one of your brainstormed ideas. Back to our pasta blog example, combining the word “pasta” with a list of 4-letter words starting with “p” can give us ideas like “PastaPack,” “PastaPigs,” “PeakPasta,” etc. Similarly, nounsstarting.com provides lists of nouns by first letter, and A-Z Animals does the same for animals. More and more brand names are being formed by using pairing a relevant word with a random noun, like Survey Monkey or BuzzSumo (or GrowthBadger 😄). For something a little different, Feldark Realms will generate fake words like “Bismig” and, well, “Feldark”. Just make sure the words you nab are easy to spell (and that they truly are fake). If none of those work for you, you can also glance at a big, indiscriminate list of the top 500 words in English right here. Method #5: add, subtract, or substitute letters from your existing words or words related to your subject. Super simple, but that doesn’t mean it’s easy. Method #6: use domain name generators (URL generators). I love this method because it checks off multiple boxes all at once. Using domain name generators, you can not only find new name ideas — you can also check whether the .com URL is available at the same time. But I should warn you that sometimes these tools will say the URL is available when actually it isn’t. Namemesh – combines two or more words into a .com URL, and also provides related ideas below. My favorite categories are “Similar” (which includes related words you may not have thought of), and “Fun” (which provides alternate spellings and other modifications). Lean Domain Search – lists a ton of available .com URLs that include the word or phrase you insert. The nice thing about this one is that you can get lots of good ideas from just one word. Tip: hit the option on the left to sort by “length”. Batname – what makes Batname awesome is that you can use a @ to include related words, synonyms, or things belonging to a category. For example, #metal or #animal. What about blog name generators? The problem with most blog name generators is that they either don’t give you enough control, or they don’t check for .com domain name availability, or they come up with names that are way too long. So in general I don’t recommend blog name generators, but if you’ve made it this far without any good ideas you can certainly give one a shot. Now that you’ve got a great list of blog name ideas, it’s time to narrow them down. This section will give you specific guidelines to help you cut down your list of potential blog names. By the time you’ve finished with this step, you’ll only have a few top options left. Sharpen your axe and let’s start chopping. Not every successful blog or business follows every one of these rules, but the more of them you can follow, the better. Short names that invoke some kind of visual image using a concrete noun are among the easiest to remember. Other factors that can make names memorable include alliteration (Coca-Cola, Best Buy), rhyming, humor, or familiarity (as long as it’s not too similar to something else). #2: It should be easy to read, spell, and pronounce. This rule has plenty of exceptions, like Lyft and Google (a misspelling of “Googol”). But there’s no denying that the harder to it is to spell or say a name, the harder it is to find or share it. This also means avoiding using numbers, or hyphens in your URL. Having an easy-to-read, easy-to-pronounce name makes it easier for people to spread the word. It also creates cognitive ease, which makes your blog seem more trustworthy and likeable. #3: It shouldn’t make people think it’s about something else. A blog about startups could be called StartupStories, but a blog about politics should not be. b) Name it something that doesn’t really mean anything (Wait But Why, Mashable, The Blonde Salad). You may also consider what your name means in other languages, but that can turn into a massive distraction so I wouldn’t get too caught up in it. #4: It should sound like a brand name (rather than a generic description). There’s a difference between naming your blog something related to what it’s about and giving it an overly literal description as a name. “Backlinko” or “Best SEO Blog”? One feels like a brand, and the other feels like spammy junk. Think about the most popular blogs you follow. I bet they all have brandable names. It’s also true that the more specific and literal your description is, the harder it will be to expand your topic coverage later if you want to. #5: It shouldn’t be already taken. This one seems obvious, but there are a few important things to check here. A) Google it to see what comes up. Is there already a business out there with the same name? Is it the nickname of a big celebrity? Is it a natural phenomenon? You’re going to want your blog or business to come up #1 when people search for its name, so it’s best if there are no (or few) existing Google results for it. As far as I know (not a lawyer), trademark infringement is usually only an issue within the same industry… but you don’t want to put yourself in a position to get sued, whether rightly or wrongly. Plus the Google thing. C) Make sure the .com URL and major social media accounts are available. If you’re going after a US-based audience, a .com domain is still the gold standard. It’s the default people think of. There are certainly successful blogs and companies that have used alternative TLDs like .net, .blog, .co, .me or .io, and depending on your audience one of those might be fine. But more often than not, you’ll be better off with a .com. #6: Make it as short as possible — both in terms of letters and syllables. Not only does this play into some of the other factors (shorter = easier to spell, remember, and brand), it’s also good for SEO because it leaves more room in your title tags for your target keywords, without requiring you to remove your brand name. A short name also makes it easier to fit into your social handles — for example, Twitter’s username limitation is only 15 characters. #7: It should fit your target audience — and the aspirations of your blog or brand. If you’re going to do serious, in-depth financial writing, “BallerDollars” is not a good name. Likewise, if you want to eventually have a lot of different contributors to your blog, don’t give it your personal name. Think about not only what your initial focus might be, but also how that might change and expand over time. #8: You need to like it enough to live with it. When Phil Knight commissioned the Nike logo, he wanted a simple, fluid design that conveyed speed. The Swoosh is now one of the most recognizable brand logos in the world, and it’s studied in design schools everywhere. You don’t have to love your new blog’s name. All the other factors are more important. But you do need to like it enough to live with it. You want to be able to stand up straight when you tell people what it’s called. Congratulations! If you’ve made it this far, you’ve given it more thought than 95%+ of other bloggers. If you want, you can actually stop here and just decide. But to really find the best blog name, it’s not enough to use your own judgment. If you’re really serious, you need to test your beliefs with other people. A special survey to get people’s opinions about your name ideas as well as test for other things like hear-ability and memorability. In most cases, this survey is all you’ll need to make a decision. For those of you who want to be extra-thorough, a more advanced behavioral test that mimics Google to check how people will actually respond to your blog names in the wild. Both of these tests use Amazon Mechanical Turk, which is basically a freelance site that specializes in tiny little tasks. You can also send these tests to your existing audience if you have one that’s big enough. Important note before you test: be sure to register any domains (buy the URLs) for the names you’re strongly considering. I recommend using Google Domains or Namecheap for this, both of which have limited refund policies for the URLs you don’t want to keep. If you don’t register your domain ideas, one of your test respondents will register the domain out from under you. Also consider grabbing any likely misspellings, and the major social media profiles. All right, let’s test some blog names. Using a survey allows you to find people’s gut reactions, pre-existing associations, biases and more. If that all sounds too soft and squishy, you can also use a survey to test how memorable your blog brand name ideas are, as well as how easy they are to hear and spell. To get started, head over to Google Forms, log in with your Google account if prompted, and hit the red “+” button to add a new survey. Name it something simple like “Blog name survey”. Now we’ll quickly create 6 different sections of questions. This section will tell us how easy it is to hear, understand, and spell your blog or business name ideas. First, click the “Tt” button to add a section title. Then click down to the first question and change its type from the default “Multiple choice” to “Short answer”. Set the question to “Required”, too. Now we need to add a link for people to hear you saying your first name idea. All you need to do is grab your smartphone and record yourself saying the name. Say it clearly, but at a natural, conversational speed. On iPhone you can use the built-in Voice Memos app for this, or if you’re on Android there are plenty free voice recorder apps on the Play Store. Now go to Google Drive and upload your recording (by either dragging and dropping the file or hitting the “+ New” button). Right-click the file you just uploaded, hit “Get shareable link” and copy the URL that it provides. Then paste that in as your question (by itself, with no other text). Now hit the “+” button to add another question and go through the process again for your next voice recording, until you have links to audio recordings of both or all of your top blog name ideas. This section will let you know what your website name ideas make people think of. If one of your URLs makes people think of something dirty, this is how you’ll find out. Start by clicking the button to add a new section to your survey. Remove its title (default is “Untitled Section”; just delete that text and it will change to some gray placeholder text). Then hit the “+” button to add a new question. What ideas, words or phrases come to mind when you see the website name “example.com”? Be sure to replace “example.com” with one of your blog name URLs. Then make the question required. Now hit the “duplicate” button to create an exact copy of the question, and simply replace the URL with your next idea. Repeat if necessary to cover additional URLs. In addition, the questions in this section can also help you find out a little more about the people taking your survey. Like before, click the button to add a new section to your naming survey, then delete its section title. Including the math question will help verify that people are actually reading your questions and not just clicking random answers. Remember, you want your name to be as memorable as possible. So now that we’ve distracted your survey takers for a bit, it’s time to find out if they still remember your website name ideas. As usual, create a new section and remove its title. Then add a single new, required question. Change it to the “Paragraph” question type. We already asked what people think about your name ideas. Now it’s time to ask how they make them feel. Believe it or not, you can get much different responses to that simple difference in phrasing. Again, you want to use an untitled section for this, make the questions required, and use the Paragraph question type. Replace “Example Name” with your name idea, then duplicate the question for each of your alternative ideas. Time to ask, point-blank, which of your site name ideas people prefer and trust most. In a new, untitled section, add the following two required questions, replacing the example names and URLs with your ideas. Which name is more trustworthy as a blog or business? Now that you’ve got all your questions in place, you just need to tweak a couple of settings and your survey will be ready to roll. Click the “three dot” menu at the top of the screen, then hit “Settings”. Select the options to “Show progress bar” and “Shuffle question order” (your sections will appear in the same order, but the order of the questions within them will be random). Then add a confirmation message like “Thanks! Your unique survey code for Mechanical Turk is: 10365848921“. But replace the number with any other random long number. The number will be used as a code by your survey respondents to prove they finished your survey (Amazon Mechanical Turk will prompt them to submit it). Just make yours long and random enough to make it seem unique to each person, even though it won’t be. Save your settings and your survey is ready! Now let’s get some people to take it. As I mentioned, Amazon’s Mechanical Turk (aka MTurk) is basically just a freelancing site that specializes in tiny tasks, down to just pennies each. We’re going to use it to get hundreds of survey responses at a very low cost, all from the US (or another country if you’d like). Head over to mturk.com. If you’ve used it before, sign in. If you haven’t used MTurk before, hit the “Get started with Amazon Mechanical Turk” button in the middle of the screen. Then choose the option to Create Tasks (“Create a Requester account”) and go through the steps to get set up. The amount of credit you’ll need to buy depends on how many name ideas you’re going to test in your survey. That’s for two reasons: first, the more names you’re testing, the longer your survey will be. Second, the more names you’re testing, the more responses you’ll need in order to get enough data to make a decision. Once you’ve bought your credit, head over to Create ➡ New Project. Number of assignments per HIT: 50 for each name you’re testing. So 100 for 2, 150 for 3, etc. Now at the bottom hit the button go to the next step, “Design Layout“. This is where you’ll add the link to your survey. Pop back over to your survey on Google Forms, hit the paper airplane icon at the top right, hit the link icon and copy the shortened URL. Now paste that link into the “Survey link” area of your MTurk project design layout, then hit “Preview” to go to the next step. Glance over your settings at the top, make sure the URL you added works, and “Finish“. You’ll be taken to your list of projects, where you can hit “Publish Batch” to start getting survey responses. Soon, you’ll know which of your blog name ideas is best. Just check out the “Responses” tab in Google Forms to see what people are saying. 5 times as many people said they trusted the name GrowthBadger more, while 2.7 times as many people said they liked it more. That made my decision a whole lot easier. This next test is strictly optional. If you’re confident in your responses from the survey test, that’s great — you can stop here! But if you want to be extra sure, this test is pretty awesome. It uses a sweet little free tool called SERP Turkey, which allows you to create your own Google search results pages, edit them as you see fit, and find out how people will respond. It was created as a way for SEO managers to test how different meta tags affect click-through rates, but we’re going to use it to see which of your brand name ideas will get more clicks. To run this test, simply follow the SERP Turkey instructions here, replacing the domain (URL) and title tag (blue link text) of an existing search result to use your blog name ideas instead. As a search keyword, put in a short phrase that people use to describe your type of blog, or a major type of content you’ll have. For example, “personal finance blog” or “pasta recipes”. Then take one of the search results and create a test search engine results page using the existing, unchanged version for the control, and a version for each of the blog name ideas you want to test — just replacing the brand name (including the URL) in one of the search results with your name idea. This task uses Mechanical Turk again, but we can pay a lot less per task than we did for the survey because it’s a much faster task. In my opinion it’s also not as important to use US-based workers, so that makes it cheaper as well. But you also need a lot more responses. One thing to keep in mind about Mechanical Turk is that it taps into a broad pool of people who will not necessarily have any specific interest in (or knowledge about) your topic. In other words, Mechanical Turk workers are not your target audience. It’s a great resource for what we’ve used it for here today, but if you have more in-depth questions about things like your content or industry, you’d be better off using something like SurveyMonkey Audience, which allows for more specific audience selection — at a higher cost. I hope this guide was able to help you find an amazing name for your blog or business! Did it help, or do you have any follow-up questions? Want to download a PDF of this guide? Click the image below. Great article, thank you! I’m planning to start a new blog soon and this is going to make a big difference. Awesome, thanks for commenting, Kim! We just started our site last month and will probably get a new theme soon and more direction with our content. We want to focus mostly about debunking myths and scams like those that are rampant in fitness, nutrition, medicine but also other spheres of life like investments, business (cryptocurrencies). Love your blog and I’m sure you will succeed with your background! BTW, I also work in a marketing agency 🙂 Growth Badger is an AWESOME name. Hey Jacob, thanks for the comment. I think “Unhype” is a great name! Super short (rare to see new .com domains that short), easy to spell, etc. It may be worth running the survey-style test just to see whether people mishear it in any notable ways — they can give you good ideas for alternate domains to buy like maybe “onhype” or “unheight” (you get the idea). But I love the name and it sounds like it perfectly fits what you’re doing. Great find and a cool idea, too — excited to see how the site develops! thanks Kyle! Btw, another trick to find good domain names is using expireddomains.net (free) — you can find some really awesome .coms for reg fee. Oh that is cool, thanks for sharing — might have to add that to the article! Any way cheers for this great article!! Thanks, Nathan! That’s custom-coded, sorry.